New Minister for Environment and Water Resources Dr Vivian Balakrishnan will be appointing a panel of local and overseas experts to conduct an in-depth review of all flood protection measures that will be implemented in Singapore over the next decade. The panel, to be appointed within the next two weeks, will assess the current drainage infrastructure, topography of flood prone area, projected weather patterns, current and future building plans, information systems and potential new technological solutions. The review process is expected to take at least six months. Minister Balakrishnan made the announcement in a blog post on Saturday, as Singapore residents experienced another bout of heavy rains in the morning. No major flooding has been reported as yet, however. MEWR and national water agency PUB released a joint statement on the establishment of a panel the same day. MEWR will also be publishing the recommendations of the Inter-Agency Drainage Review Committee that was formed last year for public consultation. They propose enhancing the drainage design standards to cope with more intense rain, requiring new developments to comply with higher platform and crest levels and requiring building managers to enhance flood protection measures. Said Minister Balakrishnan, "I believe that Singaporeans expect and deserve better flood protection. However, we must proceed in a proactive, careful and comprehensive way based on best available scientific evidence. We must also take advantage of innovative new technology and engineering solutions." And with the long terms plans in the works, other immediate measures are being implemented, he said. PUB is working with owners of vulnerable buildings to enhance flood protection and accelerating some drainage improvement projects. The higher priority drainage improvement projects include an on-going project to raise the depressed portion of Tomlinson Road by next week and works to widen and deepen the drain and raise the stretch of Mandalay Road, which will start in August and end by Deecember. Members of the public will be able to subscribe to PUB's SMS alert on water levels by 1 July. Currently, information on water levels at the canals can be found on the PUB website, Facebook page and Twitter account. The National Environment Agency also has an animated real time map of rainfall in Singapore. The PUB, which begun a systematic review of all flood prone areas in 2 June, has inspected about 70 locations to date and identified 30 that require enhanced safety measures. To date, 1.67 km of safety railings have also been installed at 14 locations. Last weekend, Singapore experienced its worst flood in 25 years. 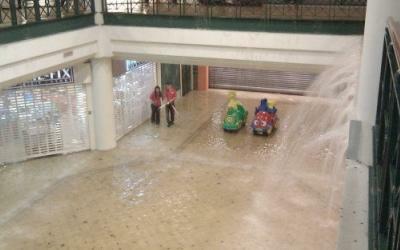 It submerged parts of Tanglin Mall and St Regis Residences. Members of the public who have suggestions or feedback can reach the PUB through email at PUBOne@singnet.com.sg or through the hotline at 1800-284-6600.